Carbo Blend (Maltodextrin, Waxy Maize [Corn] Starch, Barley Starch, Sweet Potato, Rolled Oat), Mutant Mass Pro-Matrix (Whey Protein Concentrate, Hydrolyzed Whey Protein, Whey Protein Isolate, Micellar Casein Protein, Milk Protein Concentrate, Milk Protein Isolate), Lipid Foods Blend (Fractionated Coconut [MCT] Oil, Avocado, Flax Seed, Pumpkin Seed, Sunflower Oil), Thickeners (Defatted Soybean, Pea, Guar Gum). Contains: milk, soy, tree nut (coconut). Produced in a facility that also handles ingredients from: egg, wheat, peanut, tree nut (hazelnut). Also contains barley, oat. Cocoa (treated with alkali), Natural & Artificial Flavors, Salt, Sucralose, Sunflower Lecithin, Enzymes (Lactase, Protease), Cinnamon Extract (Cinnulin PF®), Tart Cherry. As a dietary supplement, add 24-32 fl oz (720-960 mL) of water to a blender or large shaker cup, then add 4 scoops of MUTANT MASS, blend or shake for 20-30 seconds. This product is intended to be used as a dietary supplement by healthy adults. Packed by weight, not by volume. Settling of product occurs after filling. Keep out of direct light; store in a cool, dry place. Do not use if bag is torn, broken or open. Should be consumed in conjunction with a nutritious diet and with an appropriate exercise program. Consult a physician before using: if you have any ailments or conditions; any product, ingredient or health concerns; before starting any diet or exercise program. Keep sealed when not in use. KEEP OUT OF REACH OF CHILDREN. Cocoa (treated with alkali), Natural & Artificial Flavors, Caramel Color, Salt, Sucralose, Coffee Powder, Sunflower Lecithin, Enzymes (Lactase, Protease), Cinnamon Extract (Cinnulin PF®), Tart Cherry. Natural & Artificial Flavors, Sucralose, Salt, Potassium Citrate, Sunflower Lecithin, Enzymes (Lactase, Protease), Cinnamon Extract (Cinnulin PF®), Tart Cherry. Cookie Pieces (Enriched Flour [Wheat Flour, Niacin, Reduced Iron, Thiamine Mononitrate, Riboflavin, Folic Acid], Sugar, Canola Oil, Cocoa (treated with alkali), Salt, Sodium Bicarbonate), Natural & Artificial Flavors, Sucralose, Sunflower Lecithin, Enzymes (Lactase, Protease), Cinnamon Extract (Cinnulin PF®), Tart Cherry. Contains: milk, soy, wheat, tree nut (coconut). Produced in a facility that also handles ingredients from: egg, wheat, peanut, tree nut (hazelnut). Also contains barley, oat. Natural & Artificial Flavors, Red Beet Powder, Sucralose, Sunflower Lecithin, Enzymes (Lactase, Protease), Cinnamon Extract (Cinnulin PF®), Tart Cherry. Natural & Artificial Flavors, Potassium Citrate, Sucralose, Sunflower Lecithin, Enzymes (Lactase, Protease), Cinnamon Extract (Cinnulin PF®), Tart Cherry. Waxy Maize Starch, Maltodextrin, Mutant Mass 10-Protein Matrix (Whey Protein Concentrate, NitroSerum Whey Protein Concentrate, Whey Protein Isolate, Milk Protein Concentrate [Source of 80% Micellar Casein, 20% Whey Proteins], Egg Albumin, Whey Protein Hydrolysate, Micellar Casein, Calcium Caseinate, Milk Protein Isolate, Sodium Caseinate: Contains Soy Lecithin Emulsifier]), Thickeners (Defatted Soybean, Inulin, Guar Gum, Oat Powder), MCT Oil, and Sunflower Oil Powders (Coconut oil, Sunflower seed oil, Corn Syrup Solids, Sodium Caseinate, Dipotassium Phosphate, Cane Sugar, Mono- And Diglycerides, Sodium Silicoaluminate, Polysorbate 80, Tetrasodium Pyrophosphate, Soy Lecithin), Cookie Crumbs (Enriched Wheat Flour [Wheat Flour, Niacin, Reduced Iron, Thiamine Mononitrate, Riboflavin, Folic Acid], Sugar, Vegetable Oil [Soybean Oil, Palm And Palm Kernel Oil with Tbhq for Freshness], Cocoa Processed With Alkali, Contains Two Percent or Less of High Fructose Corn Syrup, Degerminated Yellow Corn Flour, Chocolate, Salt, Dextrose, Baking Soda, Whey, Soy Lecithin), Dextrose, Waxy Barley Starch, Glutamine Peptides (From Wheat), Vanillin, Natural And Artificial Flavors, Sucralose, Cinnulin® Cinnamon Extract, Flax Seed Powder, Colostrum. 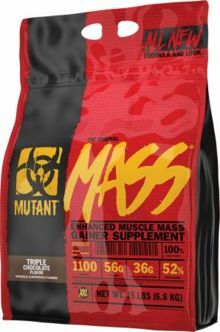 Shake or mix 4 scoops 9260 g) of MUTANT MASS with 454-908 mL (16-32 fL oz.) of water; tastes incredibly addictive in water- tastes even more fantastic in milk! You can enjoy 2 or even 3 shakes a day. Our favourite program is on training days to enjoy one shake first thing in the morning and a second immediately after training. For non-training days, simply enjoy your shakes whenever you feel you need to add MUTANT MASS! Do not exceed the stated recommended daily dose. Food supplements should not be used as a substitute for a varied diet. Store out of the reach of young children. Store in a cool, dry place. Mutant Mass is formulated to deliver everything you need to build Mutant muscle size and iron-smashing strength. One of the true mass building formula innovations of our time, Mutant Mass exceeds all user expectations for producing results in record time. Just take one look at this super-enhanced experimental formula and you'll see why*. How Does Mutant Mass Work?